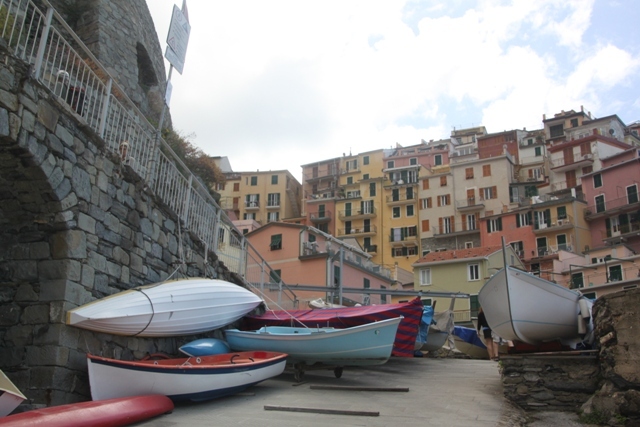 Our last full day in the Cinque Terre started off cloudy and grey. We dressed accordingly anticipating rain as per the forecast. 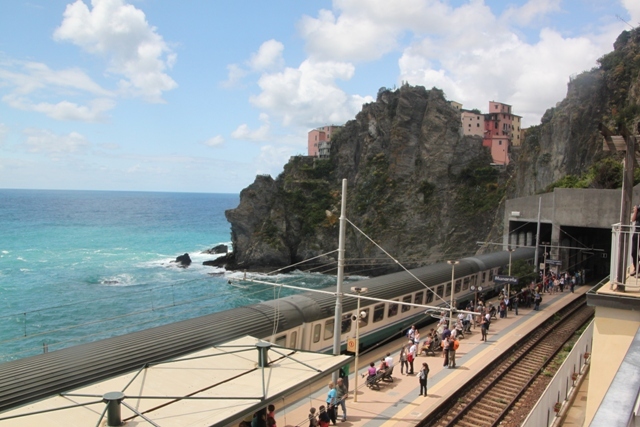 A quick train ride to Manarola emerging blinking from the railway station the clouds cleared, the sun came out and the temperatures soared. Note to self – treat weather forecasts with caution, dress with removable layers and always bring hats. Lesson learned here the hard way. Still, Manarola, yet another place that is quainter than quaint and a bit different to the others – it was bursting with boats. Covered boats of all kinds just stored all along the main street – I loved it. The buildings here seemed to be just a bit taller and the streets just a bit steeper than the other hamlets. The whole place almost leans into the sea and the rainbow houses cling to the steep, black cliffs. 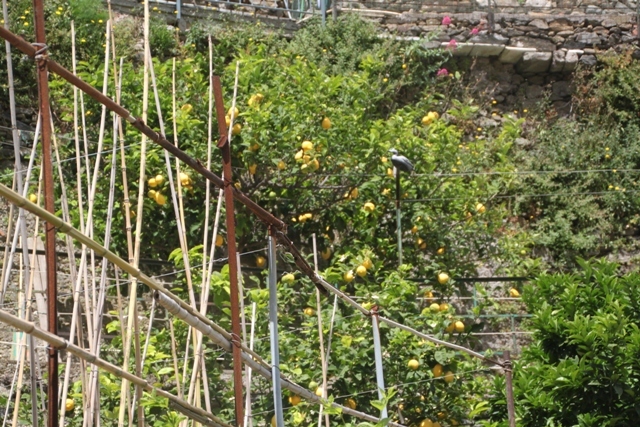 It is bordered on three sides by a terraced hillside – simply stunning. We strolled down past all those boats to the harbour, it took a while as Son insisted on peeking inside each one. A path led around the cliff so we took it as far as we could go (not so far). 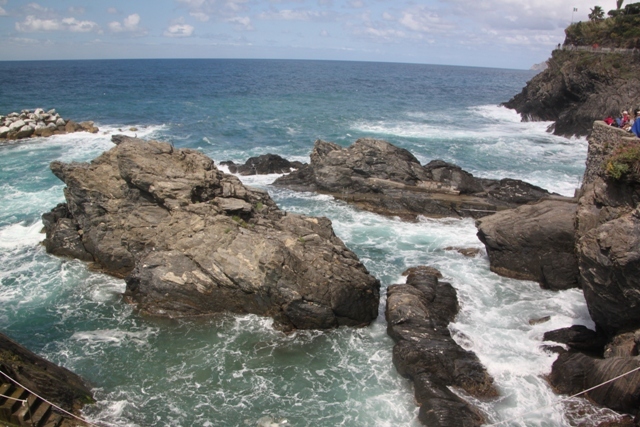 The waves were crashing onto the black rocks below and more great views back to the town – we were in no rush to move. Even our energetic ten year old was happy to hang around here watching the waves. The trail to the next village looked flat and easy, we didn’t get to confirm this – it was closed, yes another landslide. Back in the village, a bit like the Grand Old Duke of York we marched to the top of the hill and then marched back down again. 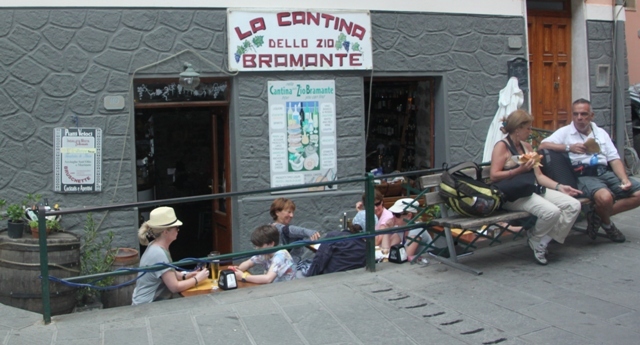 This place is full of great looking little restaurants, we picked a tiny place with tables below street level and feasted on bruschetta with pesto and tomatoes. How can everything in Italy be so amazingly delicious – even the simplest of dishes are flavour packed. 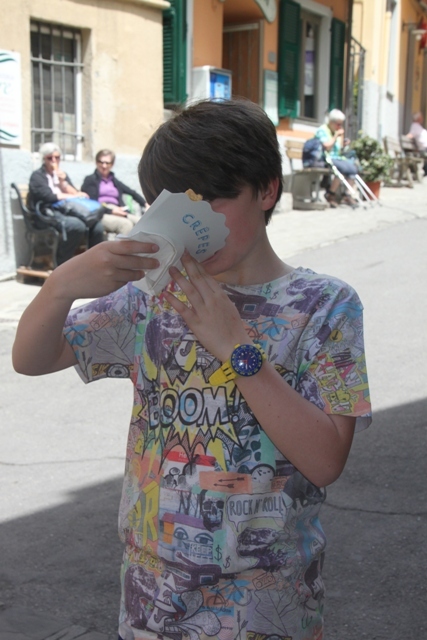 Son was in seventh heaven – next door was a place selling crepes with Nutella – his idea of a feast. 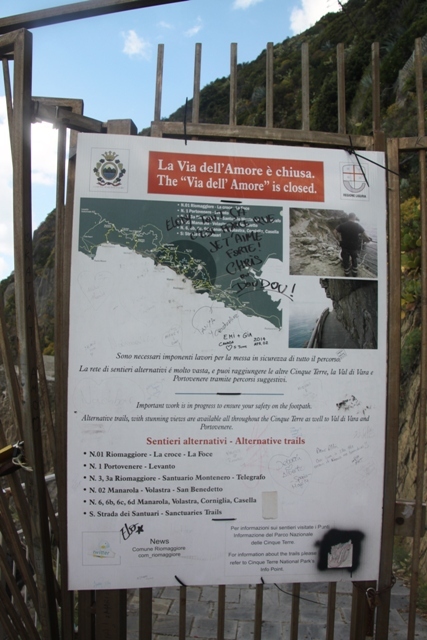 We decided to walk the Via del Amore – the most famous, paved and easy Cinque Terre hike – but no luck there – the gates to the path were well and truly closed. 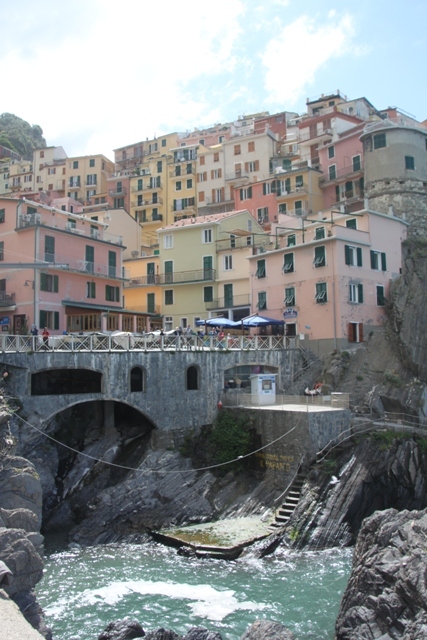 So, past the love locks and back to the train – a railway station with a view – and then on to Riomaggiore – our last (and my favourite) Cinque Terre village. Thank you – it’s a stunning place though, impossible to get a bad shot! Thanks for these great impressions again! I love the last photo with the trainstation. Don’t know why but it has something special! It is definitely a station with a view – you almost wouldn’t mind if your train was delayed here! It is so beautiful – the scenery is just stunning we loved it here and for us as a family it was up there with our top destinations. 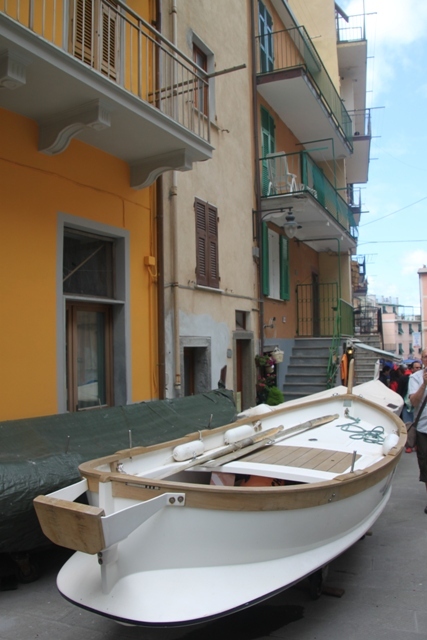 Those coastal towns in Italy are just breathtaking both aesthetically and as feats of engineering. 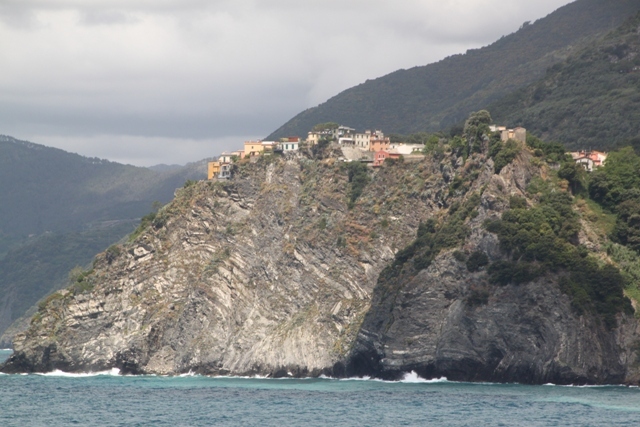 I’ve not visited this area but there were towns clinging to steep shoreline all along the Amalfi coast that have me the same impression. Thanks for the informative and interesting posts and the gorgeous photos. You just wonder how those houses have managed to cling to the rock faces! 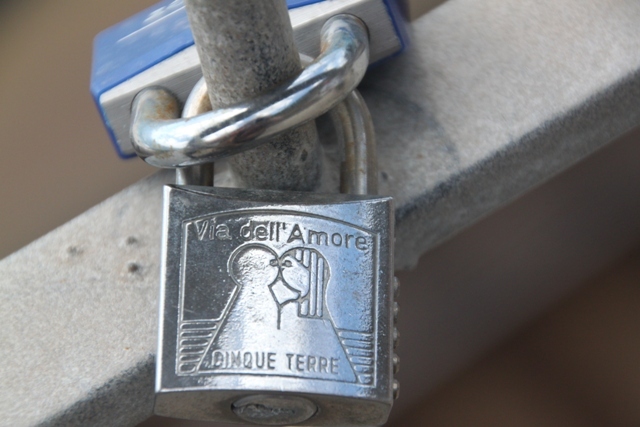 Never been to Amalfi (would love to visit), having appreciated the beauty in the Cinque Terre we are determined to get there sooner rather than later! Well if you do go along the Amalfi Coast, don’t drive. Take a boat. We drove – with a flat true to boot – and I’ve still not recovered from the trauma. It’s nerve-wracking. The second time we took a boat and even though I was sick the entire time and had my head over the side (sea sickness plus chronic morning sickness – nice for all the other travellers) it was still preferable to driving. As you point out, the people who live there are used to life on a precipice. I prefer security and roads wide enough for all tyres to be making contact. Good tip – don’t fancy dicing with death on those mountain roads, will definitely choose the boat option if we get there! Absolutely gorgeous! We’ve never been to Italy but will put it on the family bucket list after seeing your pictures 🙂 Looks amazing. 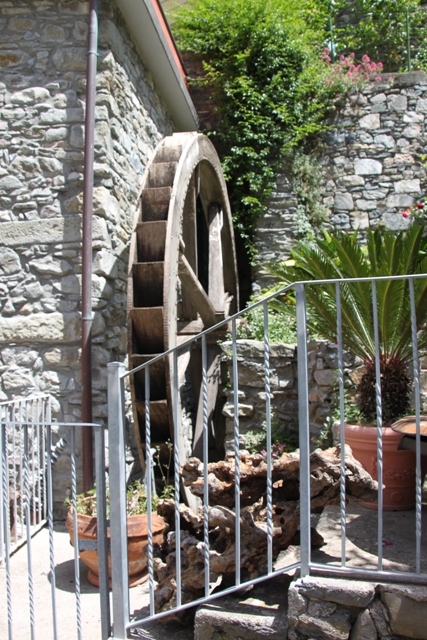 We love Italy – so great for a family holiday and this region just seems to have it all! 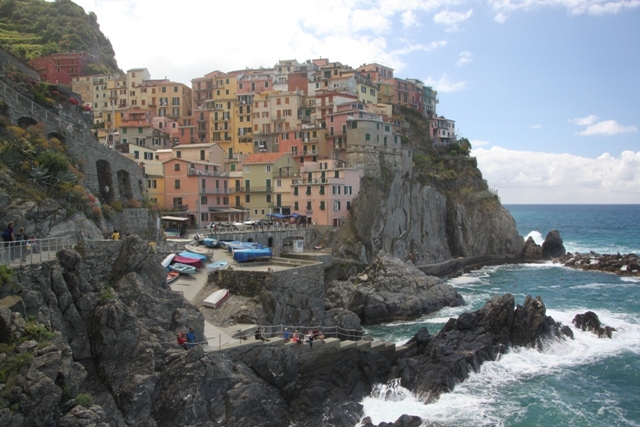 We stayed in Manarola and absolutely loved this little village. It was unfortunate that the paths were closed…we were disappointed. A lot of the paths were closed during our visit – we only got to do one real hike – we were disappointed about this too. Manarola was stunning, I just loved the views back towards the village from the cliffs. “Bursting with boats” creates such a great image. Lovely post. Love the pictures, especially the one looking back at the village where you can still see the sea as well! Wow, this is now on my list of places to visit. Absolutely stunning! That’s also most beautiful train station I’ve ever seen. It is such a beautiful part of Italy and I totally agree about the station – you wouldn’t mind at all waiting there for a train! Definitely recommend this region if you do go back to Italy. Know what you mean about those roads though – not my cup of tea!! We didn’t drive at all here, we travelled everywhere by train and it worked really well, always on time plus very cheap and no hair pin bends!! Thank you but believe me no special skill on my part!! I just point the camera and click – it is so stunning here you couldn’t not get a good picture. It looks so steep but gorgeous everywhere (I’d hate to be a sleep walker there ;))! Good shots! Oooh – never thought about that – sleep walking here would be just a bit dangerous!! It is really steep but all the puffing and hill climbing is totally worth it! 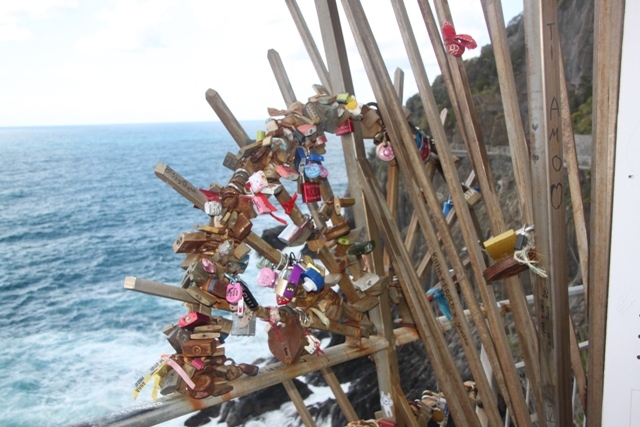 I went to Cinque Terre last spring. I can’t get over how gorgeous this part of Italy is. Your photos are stunning! Completely agree – it is one of the most gorgeous and stunning places I’ve ever been lucky enough to visit!! I was here in April of 2013! Loved it! Enjoyed reliving my trip through your pictures! 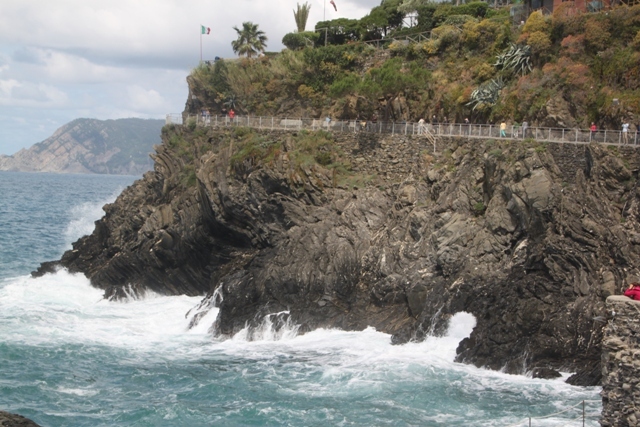 : ) When I was there, a guy was diving off of the rock into the water!!!! It’s such a gorgeous place – we loved it too. Diving off those rocks must take some nerve – definitely wouldn’t fancy trying that!! Thank you! It was delicious – I am drooling now just thinking about that pesto!! This was my favorite city! Especially on a 107 degree August day!! Great post! Thank you – tough choice for the favourite spot though isn’t it – they’re all stunning! Those amazing rocks with the sea!!! AMAZING!!!! And even more amazing?? That pesto bruschetta! yum and yum again! 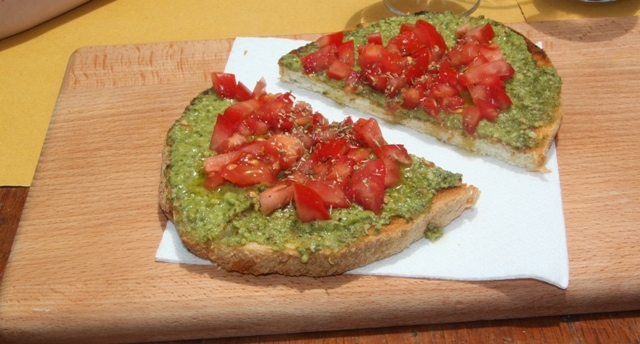 Just thinking about that bruschetta is making me drool……. it was divine!! Great photos! Manarola was my favourite of the five by a long shot! Absolutely picturesque! Thanks Bianca! They’re all gorgeous though aren’t they? Think everyone has their own personal favourite but if I could have a weekend in any one I’d be game!! They are all gorgeous! 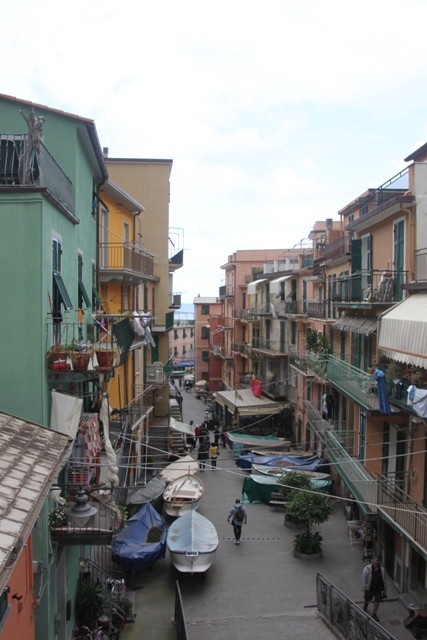 The only one I can say I was disappointed by would have to be Corniglia. If you had a boat handy and approached it from the water then I think it would have a lot more charm. The puzzle of small alley streets and accessible roof tops was also lovely and different, but that was honestly it for me. I didn’t stick around there much after that, preferred the others much more! It is absolutely stunning, photos can’t really do it justice, something amazing to see round every corner!! It really is – one of the most beautiful places I’ve been lucky enough to visit for sure!